We have four Register Offices in East Sussex located in our county town of Lewes to the west, at Crowborough in the rural north, in Hastings to the east and at Eastbourne to the south. 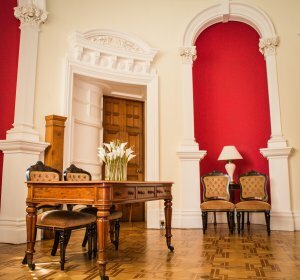 These four offices feature a choice of 8 ceremony rooms between them, ranging from the intimate Mayor's Parlour in Hastings to the largest of our rooms - the Court Room in Eastbourne with a capacity of 80. We cater for all budgets - please see our fees pages for further information. For those looking for a little bit more, we can also offer additional wedding packages to enhance your day at our beatiful Grade II* listed manor, Southover Grange, in Lewes. See our celebratory packages page for details. For more information, contact sgevents@eastsussex.gov.uk.